SIGHUPblog » Blog Archive » Whither the Eventide stomp? Just where did they get to, anyway? Eventide announced at the Winter NAMM show that they were going to be making some of their effects available as stompboxes. There was a fairly well spec’ed delay and a fairly well spec’ed modulator to start, with more to come depending on their success (harmonizer, reverb to follow?) Initial ship dates were mid-March, then word on the street was end-of-May. Since both have come and pass, I’m not sure when they’ll launch. I’m sure they will arrive eventually, but for my needs, “whenever” might be a little on the late side, as I might need one soon-ish. Specifically, I had my eye on the Timefactor delay–lovely looking thing, several delay modes, lots of controls, and most importantly, a full stereo signal path. Unfortunately, there aren’t a lot of options for full stereo delays in a compact, tabletop form (I’m mostly concerned with having stereo input and preservation of the stereo signal, not overly concerned about having control over each channel’s delay time, although that couldn’t hurt). I have a DSI Evolver, but its delay, while adequate in some cases, isn’t super on its own. My other options that I can find so far are the Boss DD-6, Boss DD-20, Eowave Space Bug, DLS EchoTap, and the new TC Electronic ND-1 Nova Delay. Each has their pros and cons. The DD-6 is too slim on the things it can do. The DD-20 has a lot more delay to offer, but the shallow part of me thinks it, like near all super-sized Boss things, is a little on the ugly side. The Eowave SpaceBug looks like a neat little thing, but I can’t actually tell if it is still in production. Last few dealers I had spoken to, there was some kind of production hold up at Eowave, no idea if that has been resolved or not. The DLS EchoTap looks good, if a little skint on controls (I’d actually like to hear some good audio clips of it in use. I found the clips on the DLS site resolutely useless for presenting what the delay sounds like). It only has a max delay of 3 seconds, good for a pedal, but low-ish for someone like me who is coming from software. I haven’t yet decided what I plan to do with the delay, so that may be too short for my needs, and would probably leave me with the DD-20. The TC Nova Delay has a similar max time, although a much expanded feature set. Here’s where the Timefactor comes in, because out of all of them, it has the feature list I am most attracted to. Still only 3 seconds of delay, but also a 12-second looper and delay controls per channel, pushing it ahead of the TC delay. So, I’m not sure what I’ll do. I may just see how far I can stretch the Evolver as a delay and wait it out. I like the look of the TC delay, but it too seems to be long in the shipping delays at the moment, so might not get me that much further ahead. 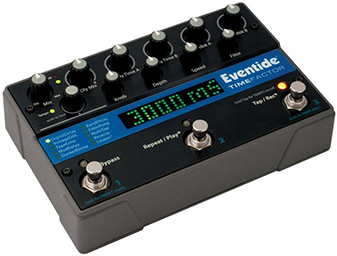 If anyone has news on the Eventide stompboxes, or if you know of another full stereo pedal/tabletop box delay, let me know in the comments. Posted: July 9th, 2007 | category: Gear Comments Off on Whither the Eventide stomp?